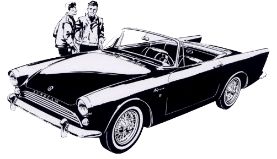 Donations to the Sunbeam Alpine Owners Club Ltd.
We thank you for your donation which will be forwarded to our Treasurer. After clicking the Donate button enter the amount in "Donation Amount" and click "Update Totals"
If you don't have a PayPal account. Complete credit/debit card details. You may print a receipt at the end of the transaction. (a) The preservation of the marque. (b) To further interest in motoring and motor sport. (c) To provide members with information, advice and assistance on matters connected with motoring and motor sport. d) To watch the local administration of the laws and regulations affecting motoring and motor vehicles, and to report any proposed local action or scheme to the Royal Automobile Club. (f) To arrange tours, lectures, discussions and social and other meetings. (g) To afford members such benefits and privileges as it may be possible to arrange. Please click the Donate button to use a debit/credit card.